Courtesy of our friends at Gofobo! 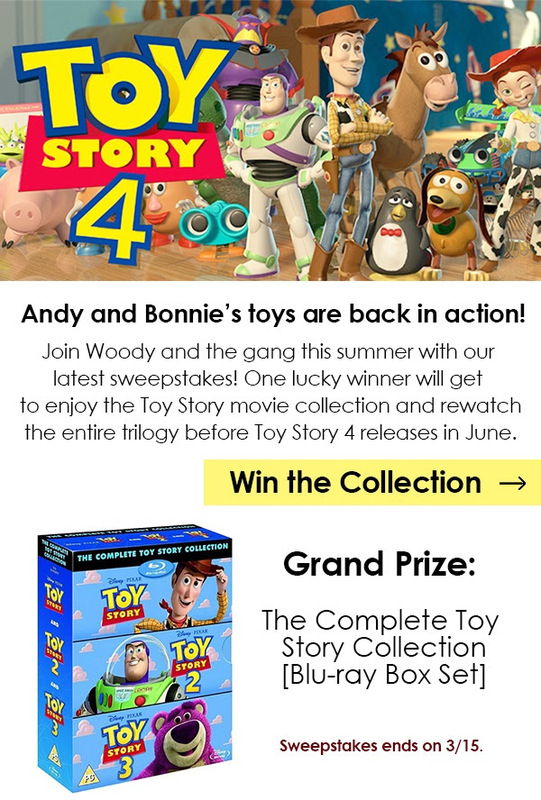 Click the image below or here to enter to win the Toy Story 4 sweepstakes! From Ken Miyamoto @ Team ScreenCraft! Check out ​ScreenCraft.org & sign up for their AMAZING e-blast list, chock full of great opportunities, information and free stuff like this. We’re so impressed with WriterDuet! You can sign up for the free version of WriterDuet and start writing today. Let us know what you think! Let’s take a moment to talk about screenwriting software. You can write a screenplay by hand, on a typewriter, on a napkin – but if you want to be taken seriously by Hollywood executives and seasoned producers, you need precise, industry-standard formatting with the help of screenwriting software. There are several options out there, the most popular are: Final Draft (however it’s decades old & expensive) and Celtx (but it’s non-standard formatting and doesn’t have professional pagination). I recommend starting with the free version of WriterDuet, which has industry-standard formatting and a ton of other professional features. You can import/export from many formats (including Final Draft, PDF and Fountain). And it offers automatic revision-tracking, backup to the cloud and real-time collaboration (for when you need a writing partner on a project). Cross-platform. WriterDuet works on Mac, Windows, Linux, Chromebooks, iOS, and Android. It gives identical page counts on all devices, and PDFs. Pasting from other sources. WriterDuet lets you copy text written in Fountain, or other screenwriting programs (Final Draft, Celtx, etc.) and paste it directly into WriterDuet with the correct formatting most of the time (impossible to be perfect). An amazing outliner. WriterDuet’s outliner lets you organize scene cards into acts and sequences, add (multiple) colors, tag characters (with optional colors/icons to identify them), set emoticons on each scene, and resize/reorder cards. All real-time collaborative. View & edit specific portions. Select characters to view & edit only their dialogue within the script, or just the scenes they’re in. Select the non-dialogue report to view & edit Action, etc. or the Shots report for a production-shortened version. Unicode support. Write in any language – Chinese, Cyrillic, Hindi, etc. Distraction-free full-screen mode. Full-screen works across platforms and is script-centric by default, helping you focus on writing. You can customize other items to be displayed, and make the normal view distraction-free as well. Ripple Effect Images Mission: Harnessing the power of visual storytelling to help scale solutions for women and girls globally. Ripple Effect Images (Ripple) is a small, nonprofit collective of National Geographic photojournalists who document aid programs helping women and girls around the world. The resulting photographs and films are donated to our aid partners to help them raise funding and awareness. Ripple has created a photo archive that is re-purposed and shared by dozens of organizations working to empower women and girls, affect policy change, and raise awareness that women and girls are the best investment the world can make in our shared future. Ripple’s extraordinary Team honors include Pulitzer Prize, National Humanities Award, World Press and Emmy Awards. In just five years, Ripple has partnered with 22 aid organizations to document their programs in 12 countries, producing 27 films and an archive of more than 20,000 world class photographs. Ripple’s robust social media network reaches more than 30,000. Ripple Effect Images is looking for a highly organized and efficient individual to coordinate communication; manage donations, expense and business reporting; research and write grants; assist in coordinating international photographic assignments; and support the Executive Director and Board of Directors. We are seeking a passionate and flexible individual with a strong work ethic and commitment to moving the organization forward. Ripple’s Assistant Director will work with some of the top people in the media industry, as well as with highly innovative aid organizations and foundations. Compensation will be commensurate with experience. Health Benefits provided. Please send a resume and cover letter to Annie Griffiths at anniegriffithsphoto@gmail.com. From time to time I’ll post information from “the Create Daily,” but I encourage all of you to join the Create Daily mailing list. Today’s opportunity is a great opportunity for female filmmakers. Submission deadline is October 31st. The Athena Film Festival and IRIS are partnering to present the Athena IRIS Screenwriting Lab. The lab is a two-day writer’s workshop that is open to women screenwriters with scripts that focus on strong female leaders. The lab gives women screenwriters the opportunity to work in one-on-one sessions with mentors in the industry. Athena and IRIS will invite four unproduced screenwriters to this writer’s lab. The lab will take place February 9-10, 2017 during the 7th annual Athena Film Festival, at Barnard College, in New York City. Writers who identify as female. Writers who have yet to have a feature-length narrative film produced. Screenplays must include a strong female character in a leadership role at the center of the story. We seek screenplays from all genres about women in all racial, ethnic, socioeconomic, and cultural groups. Screenplays must be feature-length narrative scripts in English of no more than 120 pages. We will not consider TV, shorts, plays, book excerpts, or documentaries. Scripts with more than one writer (both have to identity as female) can be considered. As part of the submission process you will be asked to include a log line of the film and a synopsis. If selected to participate in the lab you must be available to be in New York City, February 9-10, 2017 (no travel stipend provided). The submission deadline is October 31, 2016. Learn more about how to apply. We’ve been successfully connecting talented creators like yourself with awesome opportunities. Encourage your employers and colleagues to use the create daily to promote job openings and opportunities for creators (from events to resources to programs to fellowships)! Our advertising packages are affordable and positioned to be effective. 2. Join the create daily coop! The create daily coop posts awesome, high value jobs, opts, and resources daily. Test drive it free for 7 days. Hey fellow creatives. Want awesome opportunities sent to you? Subscribe to @thecreatedaily: http://ctt.ec/UP9DZ+ You can thank me later!